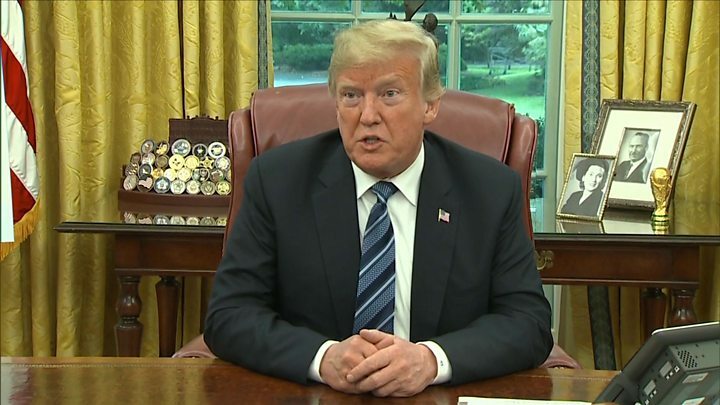 Media captionTrump: Puerto Rico hurricane response an "unsung success"
President Donald Trump has been criticised for hailing the US response to the deadly Hurricane Maria in Puerto Rico last year as "tremendous". The mayor of its capital tweeted: "If he thinks the death of 3,000 people is a success God help us all." 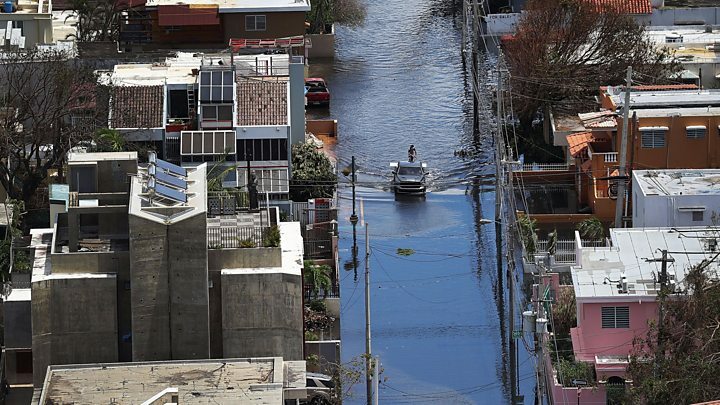 The island's Governor Ricardo Rossello issued a statement on Tuesday night, describing Maria as "the worst natural disaster in our modern history. Our basic infrastructure was devastated, thousands of our people lost their lives and many others still struggle". Maria, he said, was the "hardest one we had by far because of the island nature", adding: "I actually think it was one of the best jobs that's ever been done with respect to what this is all about. "The job that Fema [the Federal Emergency Management Agency] and law enforcement and everybody did working along with the governor in Puerto Rico, I think was tremendous. I think that Puerto Rico was an incredible, unsung success." Mr Trump had said recently: "We have put billions and billions of dollars into Puerto Rico and it was a very tough one. I think most of the people in Puerto Rico really appreciate what we've done." Puerto Rico Governor Ricardo Rossello said in a statement: "No relationship between a colony and the federal government can ever be called 'successful' because Puerto Ricans lack certain inalienable rights enjoyed by our fellow Americans in the states." The mayor of the Puerto Rican capital San Juan, Carmen Yulin Cruz, a vocal critic of Mr Trump who earlier described his response to Maria as a "stain on his presidency", said his latest comment "added "insult to injury". Senator Bernie Sanders tweeted: "Nearly 3,000 people died. That is not a 'success'. That is a tragedy and a disgrace." Democratic Senator Chuck Schumer said: "This is an offensive, hurtful and blatantly false comment from the president." New York Democratic primary winner Alexandria Ocasio-Cortez, said: "Some of my [Puerto Rico] family just got power a few weeks ago. People are developing respiratory issues partly due to airborne fungal spores from lack of proper cleanup. The admin's response to Puerto Rico has been a disaster." The island's authorities finally accepted a revised toll of 2,975 after a government-commissioned report by experts from George Washington University.